Paul Erdös was an eccentric individual to say the very least. Much has been written about him, but the following article, which originally appeared in the Washington Post, captures nicely the essence of the man I met only briefly. It's perhaps worthy of note that Erdös' only known hobby was the Game Of Go, and that his Erdos Number, by definition, is 0. WASHINGTON - One of the most extraordinary minds of our time has "left." 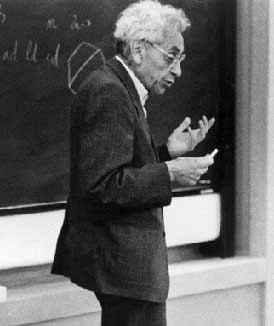 "Left" is the word Paul Erdös, a prodigiously gifted and productive mathematician, used for "died." "Died" is the word he used to signify "stopped doing math." Erdös never died. He continued doing math, notoriously a young person's field, right until the day he died Friday, Sept. 20. He was 83. It wasn't just his vocabulary that was eccentric. Erdös' whole life was so improbable no novelist could have invented him (though he was chronicled beautifully by Paul Hoffman in the November 1987 Atlantic Monthly). He had no home, no family, no possessions, no address. He went from math conference to math conference, from university to university, knocking on the doors of mathematicians throughout the world, declaring "My brain is open" and moving in. His colleagues, grateful for a few days collaboration with Erdös - his mathematical breadth was as impressive as his depth - took him in. Erdös travelled with two suitcases, each half-full. One had a few clothes; the other, mathematical papers. He owned nothing else. Nothing. His friends took care of the affairs of everyday life for him - checkbook, tax returns, food. He did numbers. He seemed sentenced to a life of solitariness from birth, on the day of which his two sisters, age 3 and 5, died of scarlet fever, leaving him an only child, doted upon and kept at home by a fretful mother. Hitler disposed of nearly all the rest of his Hungarian Jewish family. And Erdös never married. His Washington Post obituary ends with this abrupt and rather painful line: "He leaves no immediate survivors." But in reality he did: hundreds of scientific collaborators and 1,500 mathematical papers produced with them. An astonishing legacy in a field where a lifetime product of 50 papers is considered extraordinary. Mathematicians tend to bloom early and die early. The great Indian genius, Srinivasa Ramanujan, died at 32. The great French mathematician, Evariste Galois died at 21. (In a duel. The night before, it is said, he stayed up all night writing down everything he knew. Premonition?) And those who don't literally die young, die young in Erdös' sense. By 30, they've lost it. Erdös didn't. He began his work early. At 20 he discovered a proof for a classic theorem of number theory (that between any number and its double must lie a prime number, i.e., indivisible number). He remained fecund till his death. Indeed, his friend and benefactor, Dr. (of math, of course) RonGraham, estimates that perhaps 50 new Erdös papers are still to appear. Erdös was unusual in yet one other respect. The notion of the itinerant, eccentric genius, totally absorbed in his own world of thought, is a cliche that almost always attaches to the adjective "anti-social." From Bobby Fischer to Howard Hughes, obsession and misanthropy seem to go together. Not so Erdös. He was gentle, open and generous with others. He believed in making mathematics a social activity. Indeed, he was the most prolifically collaborative mathematician in history. Hundreds of colleagues who have published with him or been advised by him can trace some breakthrough or insight to an evening with Erdös, brain open. That sociability sets him apart from other mathematical geniuses. Andrew Wiles, for example, recently achieved fame for having solved math's Holy Grail, Fermat's Last Theorem - after having worked on it for seven years in his attic! Erdös didn't just share his genius. He shared his money. It seems comical to say so because he had so little. But, in fact, it is rather touching. He had so little because he gave away everything he earned. He was a soft touch for whatever charitable or hard luck cause came his way. In India, he once gave away the proceeds from a few lectures he had delivered there to Ramanujan's impoverished widow. A few years ago, Graham tells me, Erdös heard of a promising young mathematician who wanted to go to Harvard but was short the money needed. Erdös arranged to see him and lent him $\$$1,000. (The sum total of the money Erdös carried around at any one time was about $\$$30.) He told the young man he could pay it back when he was able to. Recently, the young man called Graham to say that he had gone through Harvard and was now teaching at Michigan and could finally pay the money back. What should he do? Graham consulted Erdös. Erdös said, "Tell him to do with the $\$$1,000 what I did."